I think there are enough “drunk Tony” jokes on the internet considering in the main canon he’s a RECOVERING alcoholic! The last time we saw Tony in his own comic he was under attack by the Dreadnaughts and the Siege Engineers, who aren’t on the same side. Iron Man uses that to his advantage and manages to rescue the Countess and her butler. Later Tony learns the full story about the Siege Engineer and their possible master. That same master still wants to blow up all the things but thanks to a plan by Iron Man he manages to defeat the Arms Merchant, the man behind the Siege Engineers and what they were doing to the Countess’ late husband’s auto factory…and why said husband expired. Now she plans to restore the family name since they’re no longer under the thumb of the Arms Merchant. Meanwhile, another employee at Stark Solutions takes a liking to Happy…or does she? 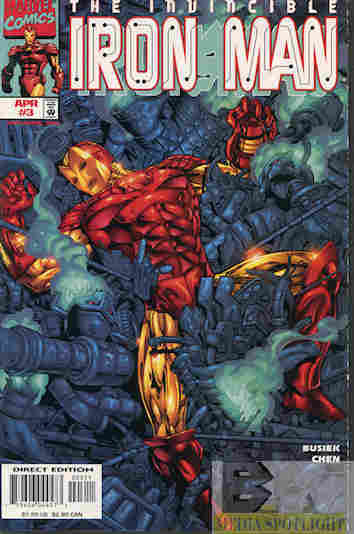 What they got right: There’s more to Iron Man than the fancy armor. Tony uses his wits to save the day, and that’s always good to see. And the Countess reforms from her early days, which was also nice. What they got wrong:The Pepper/Happy subplot gets revealed next issue so I’ll be able to go into my problems with it then. We also see Happy being tricked again like he did with Spymaster, which makes him look like a chump. Recommendation: I do enjoy this run and it’s too bad the Stark Solutions concept didn’t stay around longer than it did. Worth checking out. Posted by ShadowWing Tronix on January 16, 2018 in Marvel Spotlight, Yesterday's Comics and tagged Countess Stephanie De La Spirosa, Dreadnoughts, Happy Hogan, Iron Man, Pepper Potts, Siege Engineers.